yoshinoGRAPH is a scientific graph software for data analysis and presentation. 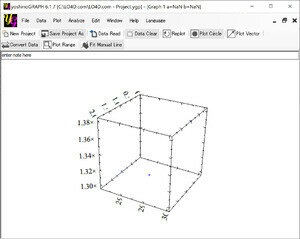 You can make 2D and 3D graphs quickly from data files in text format. This software is tiny but currently includes many basic functions to analyze/edit data as well as rather advanced ones. For security reasons, you should also check out the yoshinoGRAPH download at LO4D.com which includes virus and malware tests. Additional screenshots of this application download may be available, too.